DALLAS, April 17, 2018 /PRNewswire/ -- Guests have spoken and Pie Five Pizza has listened. Your boring healthy options just got a whole lot more exciting because cauliflower crust is now a permanent menu item at all of the brand's locations nationwide. The popular craft pizza restaurant launched its innovative, lower-carb Cauliflower Crust in January, planning to only offer it for a limited time. But that plan quickly changed after the crust was selling out at Pie Five restaurants across the country. Guests simply couldn't get enough of it. The handcrafted cauliflower crust is gluten-free, vegetarian, and only has 40 net carbs. That's less than half of the net carbs in any other Pie Five crust. The specialty crust also has less than half of the sodium found in other crusts and only two grams of sugar. Load some fresh veggies onto the customizable pizza and you're all set! "Cauliflower is rich in Vitamin C, Vitamin K, health-promoted phytochemicals and anti-inflammatory compounds. It is also an excellent source of natural antioxidants and helps improve digestion and detoxification. It's a great pizza alternative for those looking to cut back carbs," said Dr. Jeffrey Whitlow, Founder of Nutritional Information Services. 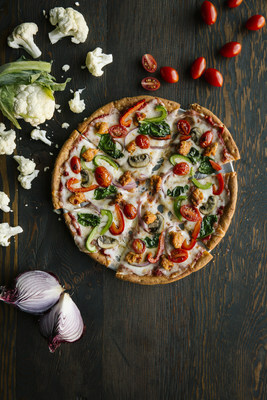 "The crust is what makes any great pizza, so it's important that our crust options are crafted using quality ingredients that taste delicious; our Cauliflower Crust definitely fits the bill," said Christina Coy, Vice President of Marketing for Pie Five Pizza. "Our Cauliflower Crust has great flavor and amazing health benefits. Load it up with all of your favorite toppings – for no extra charge – and its booming popularity makes a lot of sense. We are thrilled with the response that it has received from our loyal guests and even more excited to make it a permanent option on our menu." The new crust will be added to Pie Five's three existing made-from-scratch crust options – crispy thin, classic pan, traditional Italian along with gluten-free. So, health conscious pizza lovers rejoice – you don't have to cut pizza out of your diet! The cauliflower crust, new 14" large, shareable pizzas, wings and sandwiches, delivery and online ordering initiatives are part of the Pie Five concept refinement process and tests driven by Rave Restaurant Group, Inc. CEO Scott Crane. Crane recently introduced a new Pie Five prototype that includes a revamped interior, logo and menu. Pie Five's fast-casual concept provides guests with a fully customizable experience from start to finish. With more than 40 fresh toppings, seven savory sauces and four made-from-scratch crusts, there's a delicious pairing to match every guest's preference. Pie Five also accommodates dietary restrictions by offering gluten-free crust and vegan cheese options. Complement each pizza with a freshly tossed salad or warm cinnamon stix dessert. For more information on Pie Five's locations, please visit the Pie Five location finder. Connect with Pie Five on Facebook, Instagram and Twitter. Dallas-based Pie Five Pizza is a subsidiary of Rave Restaurant Group, Inc. (NASDAQ: RAVE). Rave owns, franchises and supplies more than 200 Pie Five and Pizza Inn restaurants operating domestically and internationally. Pie Five Pizza is the leading brand in the rapidly growing fast casual pizza space, offering individual handcrafted pizzas with fresh ingredients made to order in less than five minutes. The brand was named among Fast Casual's Top "Movers & Shakers" for three consecutive years, 2015 "Best Franchise Deal" by QSR Magazine, 2012 Hot Concepts winner by Nation's Restaurant News and one of "10 Hot New Restaurant Chains from Established Brands" by Forbes.com. For more information, please visit PieFivePizza.com. Copyright ©2019 Rave Restaurant Group. All rights reserved.